Slapping some solar panels on your rig to charge your laptop or run a TV is great, but when you start trying to replace propane-powered appliances, things get a lot harder. It can definitely be done, though – the Toaster is rolling proof! The electric water heaters we put into the Toaster were a bit of a gamble, and have worked pretty well for us, but they’re not perfect. Recently, we considered whether we should upgrade them. Central: A single, large unit supplies water to all fixtures. Because the water in the connecting pipes isn’t heated, you have a long “warm up” time as cold water in the pipe is flushed out before hot water arrives. POU: Multiple, smaller units supply hot water, mean very short lengths of pipe from the heater to the fixture and nearly eliminates warm-up time. Requires a unit installed at each fixture (or fixture group) which often means giving up space in under-sink cabinets. Some plumbing arrangements (low P-traps) and small cabinets prevent this approach with the larger (mini-tank) types. Batch: Water is heated in a tank of fixed size: after you use it up, another tank-full has to be re-heated. Because the hot water in the tank cools gradually, energy is used (standby losses) to keep water hot even when water isn’t being used. On-Demand: Water is heated only while it is passing through the unit, theoretically delivering “infinite” hot water. Requires high-power energy source to accomplish this. On top of that, there is also the choice of energy source: electric or gas. So that really makes for 8 possible options! Exciting! In residential use, sometimes multiple heating strategies are actually combined…but that’s not really worth going into here. Our 2.5 gallon mini tank that provides hot water for the kitchen sink and outdoor shower. Our 6 gallon mini tank for the bathroom sink and shower. We originally built the Toaster with two “mini tank” heaters – a POU/batch setup. Because of how much energy it takes to heat water, we knew we wouldn’t be able to just keep 5 gallons hot all the time, and we didn’t want to always be collecting the “warm up” water to reuse elsewhere. So we chose to locate two mini-tank heaters in the rig, one at each main point of use. The one in the kitchen supplies the kitchen sink and outdoor shower, which are basically right on top of each other, and the one in the bathroom supplies the lavatory sink and the shower – also very close together. The tank of the kitchen heater holds 2.5 gallons and the one in the bathroom holds 6 gallons. The current versions of these heaters are a little larger capacity than the ones we bought 4 years ago. Initially, we were happy with this strategy – when we expected to need hot water (for dishes, or for a shower) we just turned on the relevant water heater and in about 20 minutes, we had a full tank ready to go. Size: When we built the Toaster we had never full-timed in an RV, and had barely even camped in one before. So we grossly over-estimated how much hot water we would use. We were actually freaking out that we wouldn’t have enough at first! But 6 gallons of hot water is far too much for just the 2 of us to shower with, and 2.5 gallons is waaaay more than we ever need for dishes! We can both shower easily (outside) with just the water contained in the kitchen water heater (probably most full-timers could). So heating up all that water just to use half – or less – is inefficient. Time management: Waiting 30 minutes for water to warm up before showering or doing dishes is not that big a deal, but sometimes we’d get distracted by another task and not end up showering right away. Then the water cools down a bit and has to be re-heated, taking extra time and energy. There have also been times when we thought we’d shower but it didn’t happen, and that energy was just wasted outright. Dribbling: We have a foot pedal to control water flow at the kitchen sink, but the plumbing arrangement requires that we leave the actual sink faucet turned “on” while we use the pedal (to control temperature). The hot water tank acts like a little reservoir of water pressure, so even with the foot pedal off, water will drip if we leave the faucet open at the "hot" setting. The cumulative effect of that dripping is minimal, so long as we (that is, me – Ching never forgets) remember to turn it off. But if left open it could add up. So this past summer, we got to thinking about ways to improve the system. We went right out and bought a couple on-demand water heaters and installed them, right? Nope. Turns out, there is one very important factor which I left out of that table above, and that’s POWER. If you go shopping for on-demand water heaters, you’ll notice one thing right away – most of them are gas-fired. There are electric versions, but not as many, and they’re hard to find in larger sizes. The ones you do find almost always require household 220V – the same “big plug” you would use for an electric range or dryer. So clearly, that ain’t gonna happen in a solar Toaster -- our inverter only makes 120VAC. I did find some small units which could run off 120V AC, and especially like the ones by Steibel-Eltron because they have a good, long reputation and excellent online documentation. These are intended by the manufacturer for use as a small hand-washing sink. There would be some upgrades required to our wiring, but I had that worked out. So I moved on to seeing if these heaters would keep up with our real-world usage. The small units are heavily restricted to lower flow rates – max 0.5gpm – which by residential standards makes them impractical for dishwashing or shower use. But RV living isn't “residential standards”, so I thought perhaps we could make them work. I took some real-world flow rate measurements of our existing fixtures, plus one inexpensive ultra-low-flow shower head (Niagara Tri-max) specifically designed for low-flow, and determined that the flow restriction would be livable for us, which seemed encouraging. This actually was pretty interesting; I learned that our standard Camco shower wands (inside shower) were rated to exactly the same flow rate as the popular Oxygenics shower wands as well as the no-name wand on our outside shower: 2.5gpm. Evidently this is the case with the vast majority of plumbing fixtures available. I also learned that this rating is apparently done at maximum residential water pressures – around 80psi! – which is far higher than anybody’s RV water pump actually develops. The real-world flow rate of our outdoor shower wand was closer to 1gpm, and so were our faucet fixtures (also 2.5gpm rated). The Camco shower wand only flowed at about 0.8gpm, I think due to the extra height and plumbing. The Niagara Tri-Max, modified to a "wand" form factor for my showering-effectiveness trials. The ultra-low flow shower head using the Niagara Tri-max was a fun experiment; since it’s a real-shower type shower head I modified it into a “wand” with some ultra-cheap irrigation sprinkler fittings, then hooked it up to our outside shower and used it at each flow setting. It’s capable of three levels of stinginess: 0.5/1.0/1.5gpm. In reality the 0.5gpm setting flowed 0.38gpm, and that was a paltry shower indeed. Workable…if we had to…but far from ideal and possibly uses more total water due to longer rinse times. The 1.0gpm setting on the Niagra was more workable (perhaps only in contrast to 0.5, though), and the 1.5gpm setting was pretty satisfying, although in all three cases the spray pattern was wider than I’d like and that reduced the sprayer's effectiveness. But not bad at all for under fifteen bucks. So I was feeling like we could maybe get a couple new shower wands (like these) and make this thing work. That’s when I realized the real problem: Temperature rise. The light blue and orange lines are 120V-powered units from Steibel-Eltron. The faster the water flows, the less hot it can get. Even at a paltry 0.25gpm, a 50˚F rise is the absolute maximum one can hope for. With inlet water at a cool (but not crazy-cold) 45˚F, the resulting tapwater might not even feel warm to the touch -- 95˚F is below body temperature! The rectangular semi-clear tank on the right is our fresh water tank. It's typically covered by gear of all sorts. An on-demand heater has to dump enough energy into the “cold” inlet water to get it up to 120˚F (typical setting). If the inlet water is 55˚F (common in southern regions), this is pretty doable. The earth doesn’t heat up or cool down very much once you go a few feet down, so water coming out of buried pipes is a pretty reliable temperature in most regions. But our freshwater tank is very much not buried in the ground. In summertime, the Toaster’s basement is toasty, and in winter, it gets very close to freezing. This would overwhelm one of these small on-demand heaters and the result would be tepid tap water. We can cope with lukewarm dish-washing water, but a wintertime shower would be profoundly underwhelming. And that was the final nail. As soon as I finished describing the cool-winter-shower-doomsday-scenario to Ching, I knew the decision was made. I was somehow still holding on to hope for this project (I do love projects)…but when I heard the words come out of my mouth, I couldn’t make myself believe anymore. That all needs to come out before we can shower. While pulling the plug on a pet project is a bummer, all this futzing around with water heaters led us to an interesting realization: Our mini-tank heaters can be used (kinda) as on-demand heaters! Both tanks are installed with the hot outlet of the tank at the very top (this orientation is actually optional), but the water at the top is always the hottest. So as soon as we turn one on, the water at the outlet is warming up – and as it happens, it heats up pretty damn fast! For low-flow, low-volume applications (basically anything except a shower), we can just turn on the heater, wait 30 seconds, then start using water that’s around 90-100˚F. Which is quite adequate for most tasks. Showers still require mild planning but let’s be realistic here: Showers always take planning when you’re full-time boondocking! If I were doing it over again, I'd want to put an even smaller mini-tank into the kitchen – perhaps like this one – and use the 2.5 gallon Ariston heater in our bathroom for showering. This would better match the tank capacity to usage (although it would still be oversized) and save substantial energy when we actually do take a full shower, but we could still use the mini-tanks sort of like on-demand heaters for on-the-spot uses. There’s actually two silver linings, although this second one is not really news: Unlike on-demand heaters, batch heaters can be used as “thermal batteries”. Many homes relying on renewable energy do this as a matter of course: If the batteries are full and the sun is still strong, the system automatically diverts the excess power to an electric water heater so it’s not wasted (with wind power this “dump load” arrangement is actually a requirement). So the energy is still being stored – as heat instead of electric potential. If we use stored hot water from midday instead of consuming battery capacity to heat our next shower, then we save a lot of battery! Our system doesn’t do this automatically – we have to manually turn the heater on – but our charge controller does have the capacity to control a relay which could do this (aha, new pet project!). 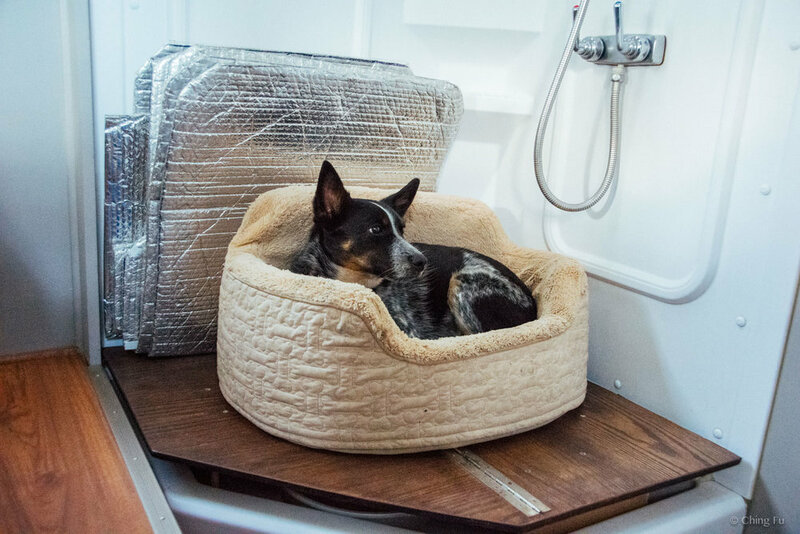 While gas-fired on-demand heaters are a great way to save propane and water in both houses and RVs, their electrically-powered cousins are probably best suited to stationary applications. Some future technological advancement may blur that line in the future, but there are certain physical constants at work here – like the amount of energy it takes to heat up a given amount of water to 120˚F – which aren’t going to change anytime soon. Electrically-heated mini-tanks, however, can be very reasonable stand-ins for conventional propane-fired RV hot water tanks with a few adjustments to use patterns and habits.